A few months ago, the Ohio General Assembly passed legislation, signed by Governor John Kasich, to eliminate the alcohol limit on beer brewed in the Buckeye State. A few weeks ago, local breweries were permitted to start selling the more high-octane suds to customers. Breweries had been restricted to beer that was no more than 12 percent alcohol by volume. Now, the sky’s the limit. Interestingly, the change was made to try to make Ohio more competitive in attracting craft breweries. The beer business has been booming, and although Ohio already is home to many excellent breweries, lawmakers were worried that some companies were limiting their operations here because of the brewing restrictions. When the bill was passed, its sponsors emphasized that the high-alcohol beer wasn’t designed for sale to people who wanted to chug, saying it was a “sipping beer” that was an “extension of an art form.” According to press reports, one of the beers that is now brewed and available for sale is a triple oatmeal Russian imperial stout, which is 13.8 percent alcohol. I like to have a beer now and then, and when I’m ordering at a brew pub I pay attention to the alcohol information about the available options. My tastes tend toward lighter, lower alcohol beers, because I’m looking for refreshment and particular kinds of taste. I don’t think I would even want to try a super dark beer that was 13.8 percent alcohol — which would really pack a punch. It doesn’t sound like the kind of beer you’d drink while eating a cheeseburger. But if eliminating the alcohol limit allows Ohio breweries to cater to people who do crave that kind of concoction, I’m all for it. Every year Kish and her high school friends take a trip together. This year they decided to hit the Bourbon Trail in Kentucky. Today the merry band visited the Woodford Reserve Distillery, where Kish snapped a few photos and sent them along. Interesting, isn’t it, how alcoholic drinks seem to wax and wane in popularity? One year everybody’s drinking scotch, another year it’s vodka, and once in a while it’s tequila. Bourbon seems to be a hot choice right now, with lots of artisanal bourbons being aged in special barrels and people sipping high-end bourbon on the rocks. Bourbon is not really to my taste — I’m more of a wine and beer guy — but the distilling process is interesting, and ancient, and I can think of worse ways to use wood than building fine barrels. Anyone who’s ever been much of a drinker knows how painful hangovers can be — and they’ve probably come up with their own theory about the best way to dodge them while still enjoying the simple, warming pleasures of a few adult beverages. If you ask your friends what they do to avoid the dreaded hangover, you’ll find that people swear by all kinds of different folk remedies, with an almost religious intensity. Never drink on an empty stomach. Take two aspirin before going to bed. Quaff lots of water while you’re out on the town. One of our college friends contended that eating a plate of french fries covered with gravy was a sure cure, and another insisted on going out for chili dogs. And then there are the assorted “next-day” remedies, ranging from munching dry Excedrin (to maximize its impact), to guzzling an entire pot of coffee (to allow caffeine to counter the lingering alcohol effects), to downing a large breakfast of pancakes (to soak up the remaining alcohol in your system), to sampling the “hair of the dog that bit you” (to start working on tomorrow’s hangover, today). I’m a big believer in drinking lots of water, myself, and I am convinced that if you wake up with a hangover it’s too late to do much about it other than ride it out and swear you’ll never be so stupid again. Instead, the study concluded, the only surefire way to avoid a brain-crushing hangover is simply to consume less alcohol. What? Drink less? That’s no fun! You know, pancakes sound pretty good right now. 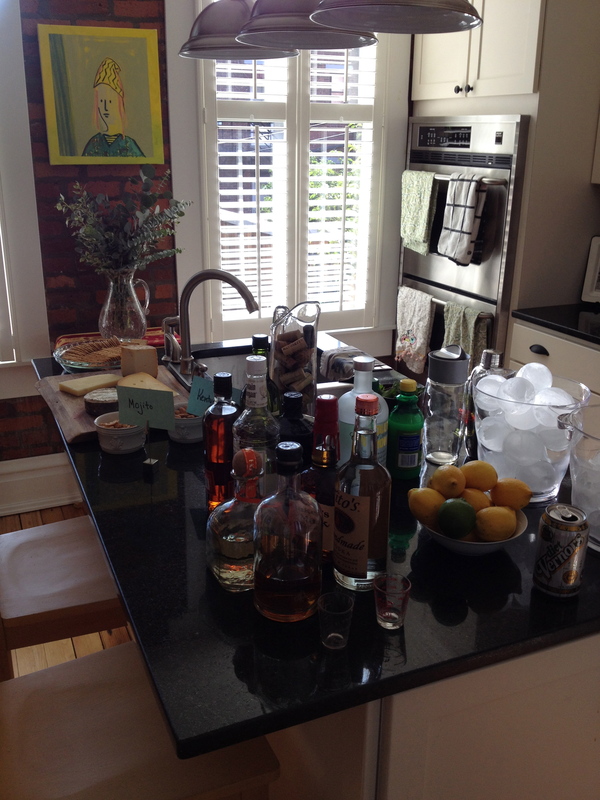 We’re having some friends over for our first non-family cocktail party at our new house. I think we’ve got enough to drink, but you can never be too careful . . . .
Dennis Rodman returned from his ill-advised trip to North Korea and promptly checked himself into a rehab facility, saying that his behavior was due, in part, to excessive consumption of alcohol while in the land of Kim Jong-Un. I’ve got news for Rodman’s agent — no one put any pressure on Dennis Rodman but Rodman himself. No one asked him to go to North Korea and pal around with a dictator. No one — and I mean no one — would ever expect that the dysfunctional Dennis Rodman would be “combination ‘super human’ political figure and ‘fixer. '” Indeed, we’re not even sure he’s capable of being a regular human, much less a super human. All we ask is that, if American citizens go to a foreign country that regularly issues anti-American statements and engages in repressive conduct, they at least keep their mouths shut and not make statements and engage in conduct that feeds the propaganda machine of that regime. Rodman couldn’t even meet that very basic standard. If Rodman in fact has an alcohol problem, I hope he addresses it, sobers up, and becomes healthy. And then I hope we never hear of Dennis Rodman again. I had no idea that a curious branch of archaeology is focused on reconstructing the hooch guzzled by the ancients . . . but it seems like a very worthwhile scientific endeavor. Of course, alcohol was an essential element in the development of human civilization. Some archaeologists believe that the reason early humans stopped their hunter-gatherer lifestyle and decided to settle down is that they wanted to raise grain crops that they knew could be fermented in all kinds of interesting ways. Studying the development and consumption of alcoholic beverages therefore seems like a good way to learn something meaningful about human civilization. Interestingly, Dogfish Head Brewery will actually be producing some of these ancient recipes for our modern consumption. That development will allow us to determine for ourselves the most important element of these antique cocktails: how do they really taste? And, upon careful reflection, would the ancients probably have rather cracked open a Budweiser?